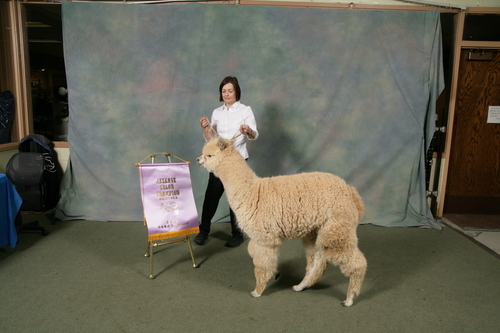 Kodiak's cria are showing well, taking Color Champion after Color Champion. 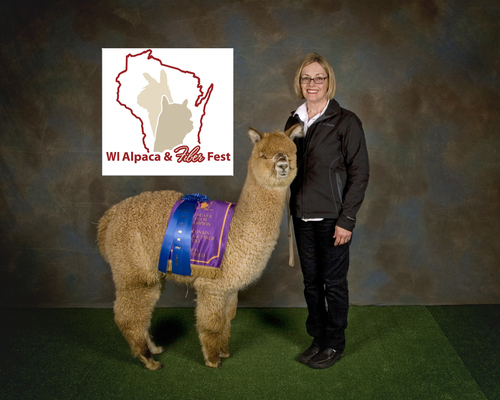 His yearling TB female took a Reserve Color Champion at Nationals, his juvi TB female took a Color Champion at Buckeye, and his medium fawn male took a blue at Nationals and a Color Champion at the Wisconsin show. 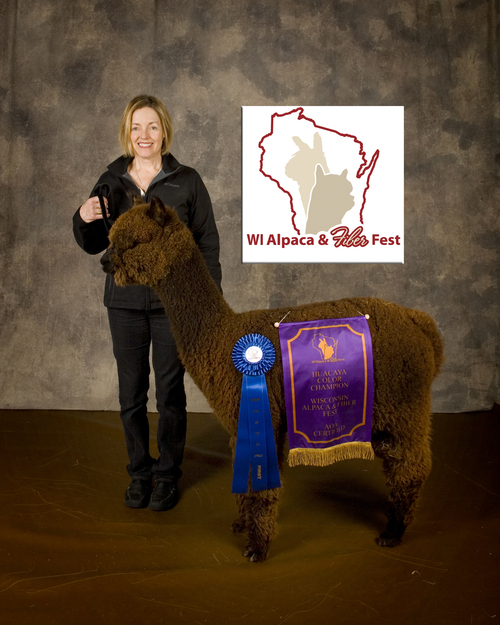 The 2015 show season began with Kodiak cria taking home Color Champion and Reserve Color Champion. To top it off, Kodiak won first for Get of Sire, and Lisa took a blue in Breeder's Best of Three with three Kodiak TB female cria! Add to that, Kodiak showed as an almost six year old and won Color Champion as well as a blue! Amanda loved his staple, fineness, uniformity, density, conformation, and true black color! At 5 years of age, Kodiak took two blues and a Reserve Color Champion! Peter loved this solid macho male, his square frame, teddy bear head, amazingly fine, uniform and dense fleece. Kristin Burhmann confirmed! This is an incredible male! 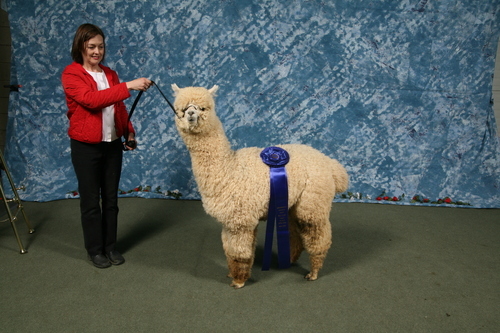 We are thrilled to share ownership with DG Alpacas of Ohio and Alpacas Del Valle Cereza of California. Kodiak comes from a long line of champions who produce champions. 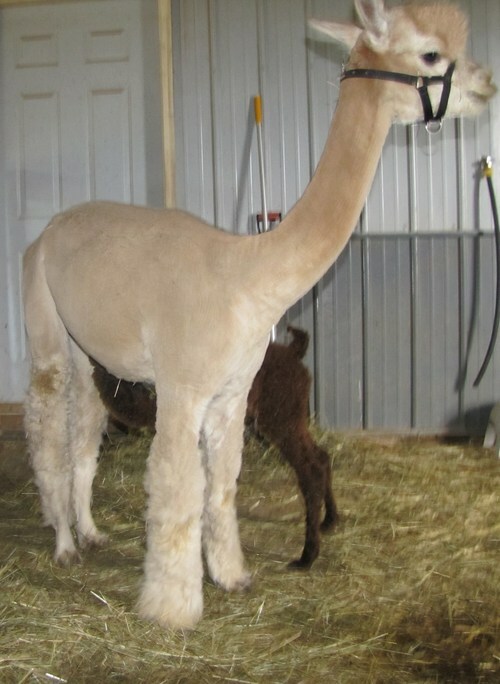 His sire is CPeruvian Axion Jaxon. Kodiak's dam is AVC 20th Century Fox who is sired by 6Peruvian Accoyo Titan. She also carries Accoyo Camilio behind her. Not only is Kodiak genetically packed, he has perfect conformation. Kodiak is a compact male with large straight bone structure. His bite is perfect, and if you look at his photos you can he is gorgeous. As for his fiber, it is not often you come across a true black with NO white fibers. Kodiak is solid black with uncompromising fineness, density, and uniformity of micron and crimp. Confirmed BVDV negative. Breedings will be limited. McKala has beautiful soft fleece with bundles of crimp cascading throughout her blanket. Her fleece has a high frequency crimp style with pencil bundling and webbing throughout. She has soft rolling skin all down her neck and all along her back. Her bone structure is dense, with powerful straight legs. Her conformation is flawless, with compact stature. McKala's coverage is COMPLETE! Her density is untopped, with crack even on the cheeks of her face. McKala's light fawn color is uniform. McKala has a topknot that spills over in from of her eyes framing her small beautiful face forcing her to angle her head up to see. McKala is a champion producing foundation female! Confirmed BVDV negative.